I really like the packaging. I was skimming the pudding section when they caught my eye. I should have just bought 1 to be safe, but I bought 2 of the 3 flavors they have out (peach is the third flavor). My daughter helped me unload the groceries and was happy to discover these new treats waiting for her (so the packaging works on the young ones too, at least the ones that love yogurt!). Right off the bat I'm thinking that's not going to be enough granola. 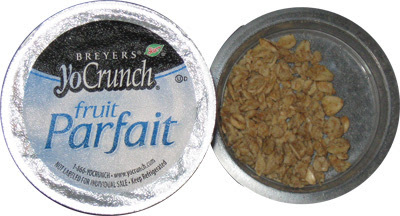 The fruit to yogurt ratio doesn't match the Breyers packaging which implies a 2 to 1 ratio. I'd say this is more of a 3 to 1 ratio at best - the picture above implies it's high, but rotate the cup 180 degrees and it would look like even less (granted you can see the containers before you buy, so i can only complain so much). I must note that the smell is awesome! It's like some wonderful strawberry dessert waiting to be eaten, and that's with the strawberries on the bottom, I haven't even mixed it yet. nutrition is great on this treat. 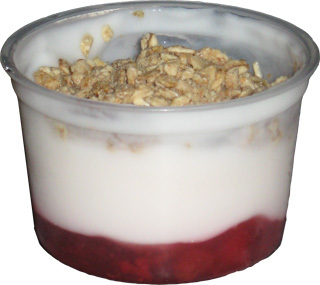 It's just 120 calories (15 from fat), 1.5g of fat (0.5 saturated), 1g fiber, 3g protein. It's not terribly filling, though I can't say I want a second one... well, I was tempted to chase the strawberry one with a blueberry one, maybe tomorrow (we'll save that for the second scoop). Now this new treat isn't all natural, but this is Breyers so the ingredient list is fairly slim and reserved --- just ditch the potassium sorbate and the modified food starch and we're good to go.... oops, and the red #40 (that explains the bright color). Now there is a dollar off coupon on the website if you want to try these. Also, I love marketing geniuses: they have a love it or dislike it poll. Well if you don't dislike it, then you have to vote for love it in which case they can now claim that 81% of people "love" the new snack... but that's not really fair is it? There should be at least 3 choices. I would vote for like it, and with a little ratio tweaking, I would vote for love it. Leave these near the back of the fridge so they are nice and cold! On Second Scoop: I can't believe I just ate the blueberry parfait rather than digging into a fresh pint of haagen-dazs. I try to reinforce the idea that it's good to have a healthy selection of heavy and light treats at your disposal, and since I polished off my last practical frozen treat last night, well, it was yogurt time. I did enjoy my treat, but like the strawberry one, I wish there was just a bit more blueberry (and a smidge more crunch) in my treat. Actually it wouldn't hurt if the cup was a little bigger too, it's still good though, give them a try. On Third Scoop: I couldn't resist and decided to pick up the Peach Parfait since the others are pretty good. It's actually pretty good considering I never do peach yogurt, or peach anything for that matter. Now they just need a raspberry flavor!